This bohemian dream catcher art started as twigs from the woods behind our Adirondack home. The twigs were soaked, bent and woven into a wreath which takes on it’s own unique shape. Wooden beads in the four colors of the elements were woven into the dream catcher and the center was finished with a pentacle charm. The green, yellow, red and blue to represent earth, air, fire and water are in the cheerful fabric strips Strings of wooden and silver beads also hang from the wreath. It was finished with some smile-inducing silk flowers and has a loop to hang it. 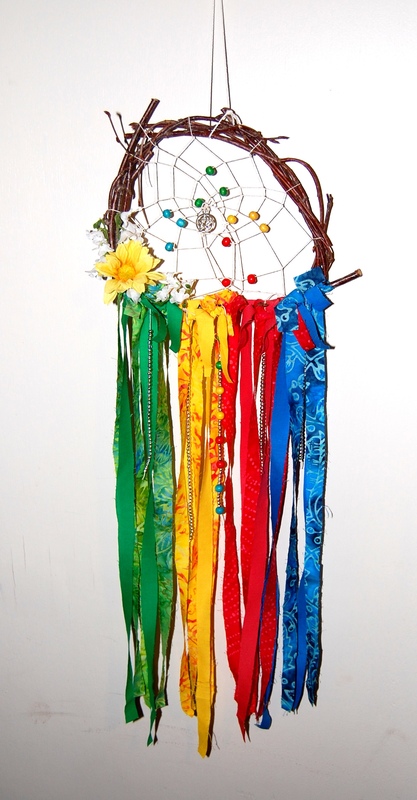 Only the happiest of dreams will come through this dream catcher! See this and other dream catchers in our Etsy shop.